That vaguely attractive androgynous face up there belongs to Socibot, a super-creepy robot that can wear any face at all – even your own. Meant to act as a humanoid interface at trade shows, airports, shopping centers, and other public settings, the Socibot takes over some of the tedious human interaction chores. It can even act as a physical stand-in during teleconferences. 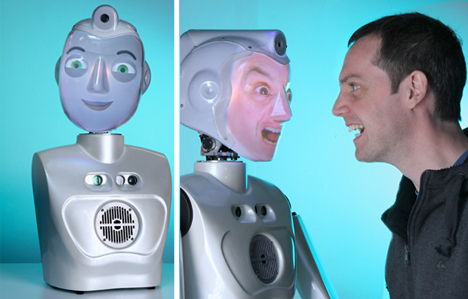 The robot – Socibot is the larger floor model and Socibot-Mini is the tabletop version – has a fully articulated neck. 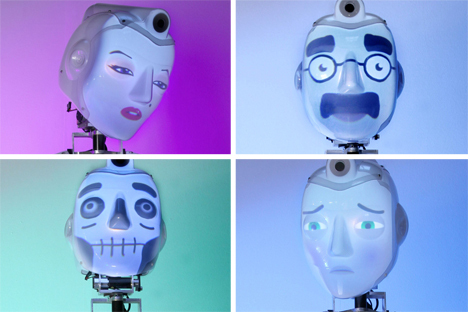 The robot can read the emotions of the humans around it and respond appropriately, both with facial expressions and with body (or head, anyway) language. The ‘bot can even keep track of up to 12 people in a room at a time, even in a large crowd. We aren’t sure what practical purpose this would serve, but there has to be one, right? It can’t be just about the creepiness factor. The oddest thing about the Socibot, by far, is its ability to put on any face you wish. It can look like you, your friends, celebrities, or a generic computer-generated human face. An internal projector is used to change the robot’s visage as wanted. Some are pre-set and others can be programmed. When the ‘bot talks,its lips move in perfect synchronization with its virtual words, increasing the level of uncanny valley-type creepiness. 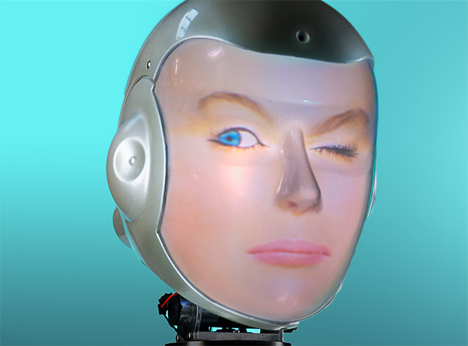 The Socibot can scan a human’s face to determine his or her age based on facial lines. And if you have to get up and walk around for a bit, the Socibot’s eyes will follow you around. Socibot is designed to be as user-friendly as possible, requiring little to no instruction for the general public who would be using the bot for information in a public place. It can understand simple gestures like waves and postures. Owners can program Socibot’s behaviors to determine how it interacts with crowds. 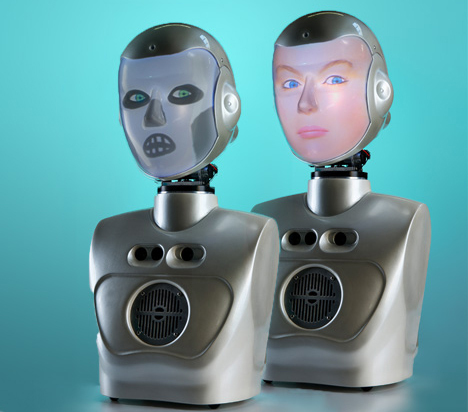 The combination of changeable face and programmable behaviors make Socibot one of the most fascinating – yet still (not to beat a dead horse) super-creepy – modern robots. See more in Robotics or under Technology. April, 2014.